Shell Oil Company is the United States-based subsidiary of Royal Dutch Shell. Its parent is a multinational oil company ("oil major") of Anglo Dutch origins. Royal Dutch Shell is one of the largest oil companies in the world. Approximately 22,000 Shell employees are based in the United States The head office in the United States is in Houston, Texas. Shell Oil Company, including its related companies, is one of the US’s largest oil and natural gas producers, natural gas marketers, gasoline marketers and petrochemical manufacturers. 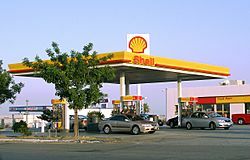 Shell has approximately 25,000 Shell-branded gas stations in the US. They are Shell's most visible public presence. Shell also owns the Jiffy Lube chain of auto oil change stores. Since 1998, Shell Oil Company is a 50/50 partner with the Saudi Arabian government-owned oil company Saudi Aramco in Motiva Enterprises. Motiva is refining and marketing joint venture which owns and operates three oil refineries on the Gulf Coast of the United States. Motiva also operates 8,000 Shell-branded gas stations in the eastern and southern United States. Shell also used to hold 80% of an exploration firm called Pecten that explores and drills in various offshore locations including the oil basin near Douala, Cameroon. It sold the 80% to Addax Petroleum on 31 October 2011. Shell Oil Company Facts for Kids. Kiddle Encyclopedia.